What makes a society healthier? Since our founding, FIU has been deeply invested in answering that question — from conducting research and implementing evidence-based programs that improve the physical and mental well-being of people to ensuring the cultural vibrancy of our city through its museums and performing arts centers. This campaign objective will strengthen notable community-facing programs like Green Family Foundation NeighborhoodHELP, the Linda Fenner Mobile Mammography Center, the Center for Children and Families, and FIU Embrace. It will also support FIU’s rich cultural core, from The Wolfsonian-FIU, Patricia & Phillip Frost Art Museum, Jewish Museum of Florida-FIU, and Herbert & Nicole Wertheim Performing Arts Center to expansive new initiatives like CasaCuba and The Wolfsonian Public Humanities Lab. 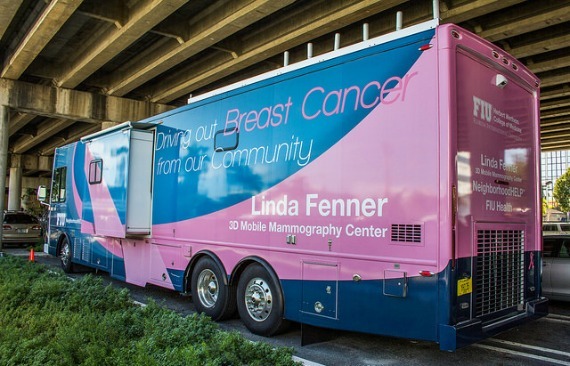 Named for a 54-year-old who lost her battle with breast cancer in 2005, the Linda Fenner Mammography Health Facility is a state-of-the-art clinic on wheels run by FIU’s Herbert Wertheim College of Medicine. It offers a 3D mammogram to any woman who needs one, but exists primarily to serve those who have limited options due to lack of health insurance. The mammography facility ensures the community has access to potentially life-saving health services, thanks to the generous support of the Braman Family Foundation — the mammovan is named for foundation principal Irma Braman’s late sister — and a matching gift from the Batchelor Foundation. It has visited the Chapman Partnership for Homeless, Camillus House and other shelters.